Harvesting wheat near the West Bank town of Tammun. Food prices in April fell from the previous month led by lower sugar prices, the United Nations food agency today reported. The Food and Agricultural Agency's (FAO) Food Price Index – which measures the monthly change in international prices for cereals, vegetable oils, dairy, meat and sugar – averaged 168 points in April. The figure is “down 1.8 per cent from March although remaining 10 percent higher than a year earlier,” according to FAO. The Sugar Price Index is down 9.1 per cent due to large export supplies from Brazil and a continued weak global import demand. Oil fell 3.9 per cent, pushed by weakening demand for palm oil and expectations of bumper soy harvests and planting in South and North America. Dairy also fell, about 3.3 per cent, while meat prices rose 1.7 per cent, led by a strong domestic demand for pork in the European Union and increased sale in China. FAO today also updated its global cereal production forecasts for 2017, projecting a likely 0.4 per cent annual decline despite stocks remaining close to their record high opening levels. The Cereal Supply and Demand Brief is expecting a drop in the in the cereal stocks-to-use ratio in 2017/18 to 25.8 per cent, “still a comfortably high figure in historical terms but slightly below the current season's level,” the UN agency said. 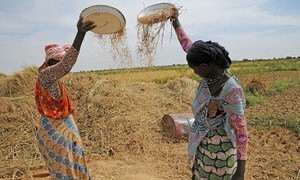 The United Nations Food and Agriculture Organization (FAO) today reported that global food prices fell in March amid large available supplies and expectations of strong harvests, and also projected “robust cereal harvests” in 2017.